Panasonic has rolled out an all new line of "Smart" and intuitive compact digicams, with the all new S-series of Lumix digital cameras. The second unit in this new category, the Lumix DMC-S1 boasts almost identical specifications to the S3, however with a bit less resolution at just 12-megapixels. It still boasts 720p HD video, fully automatic exposure control, and the Venus Engine VI image processor. Like the S3, the S1 is controlled by Panasonic's well known iA (intelligent Auto) mode, which has been a staple in the the Lumix camera line for some time now. To enhance your picture taking abilities and experience, they've added two new technologies to the mix in the form of AF Tracking (for following moving subjects), and Intelligent Exposure (prevents blocked shadows and blown highlights). Another popular trend we are seeing is automatic uploading capabilities to social media sites like Facebook and YouTube. 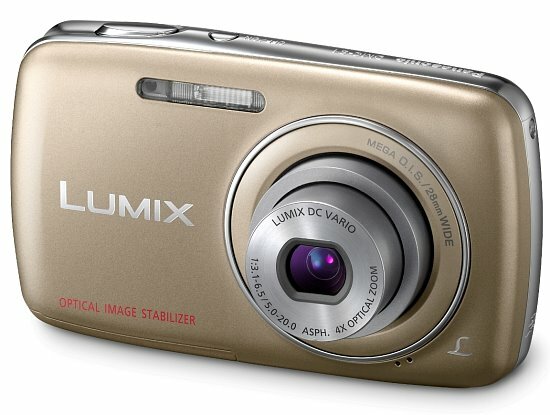 Panasonic has incorporated this functionality also, with their new Lumix Image Uploader option, which will directly upload videos to YouTube or photos to Facebook when you connect the camera to your PC with the included USB cable. The DMC-S1 will come in five pleasing colors (blue, black, gold, pink and silver), while pricing and availability details are started to arrive about 30 days prior to shipping.